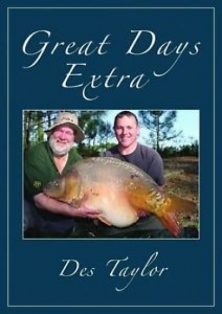 After the success of 'Great Days' Plynlimon Press have released a softback version of the book with three extra chapters hence the new title 'Great Days Extra'. The three extra chapters include the capture of a 75lb 14oz carp, another gives a blow by blow account of landing an 18lb 11oz zander and last but not least a chapter on the Middle Severn barbel I have taken in the last few years. Enjoy! "As an editor and publisher I live in a world of angling and angling writers. Most are accomplished but very few have that extra quality that makes them stand out from those around." "So what did I really think about ‘Great Days’. I’ll tell you. It is bloody brilliant. It exceeded every expectation I had and it’s better written than most of the tomes I’ve ploughed through in the past year. This is the kid from the council estate made good. But what sets it apart is he doesn’t catch a fish and say how clever he was, that it was down to pure skill or that he used a Fred Bloggs hook or Gelignite Bait. Des has enjoyed some truly memorable fishing trips in his life. This is your chance to share them."